According to the Harvard Health Blog (2018) studies in rats have shown numerous effects from intermittent fasting including weight loss, improvements in blood pressure, blood sugars and cholesterol. There have been no scholarly articles or research that I have been able to find that suggests or tests that intermittent fasting is beneficial for clearer skin. I have however been in contact with individuals who described the following effects from this process: skin clarity, reduced bloating or inflammation, increased mental clarity, reduced sugar cravings. This is obviously a very personal result, and heavily dependant on what you do drink and eat prior to and after breaking the fast (I would argue more so than the fast itself). I decided to try a simple form of intermittent fasting for one week for several reasons. Psychological Effect: the fast forces you to be mindful of what you’re putting in your body. It also helped me a lot with mindless eating in the evenings (when I normally get most of my work done and compulsively snack and eat whilst doing so). Here is how I did it and how my skin and body reacted to it. Simply put, I limited the hours of the day when I would consume solid foods between the hours of 1pm to 7pm. SLEEP TIME: I normally wake up around 8am and go to sleep at midnight. If you are trying this form of fasting you can adjust the ‘eating time’ window accordingly. Once I am showered and dressed I make a quick celery juice. I say quick because I have tried celery juicing with a juicer and I find it so time consuming. The machine takes time to process each celery stick you put through, then you have to actually clean the juicer - I found the whole process to last 20 minutes. I now use a nutribullet - I just chop the celery up into pieces, add a little water, mix for a few seconds and pour into a nut milk bag and squeeze to extract the juice. It takes approximately 5 minutes to cut, mix, drain, wash and consume. 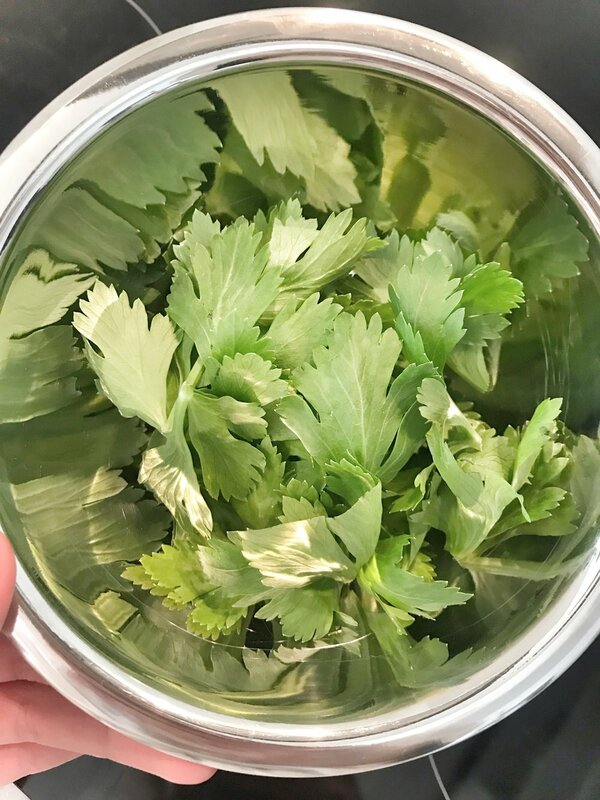 I also use the celery leaves in cooking instead of parsley - so zero waste! Filtered water and herbal tea such as mint, jasmine, green or redbush tea (with lemon and honey) throughout the rest of the fasting period. I also have a coffee every morning. It sounds like a lot of different liquids but when I’m not eating breakfast I like to keep it interesting for my taste buds. 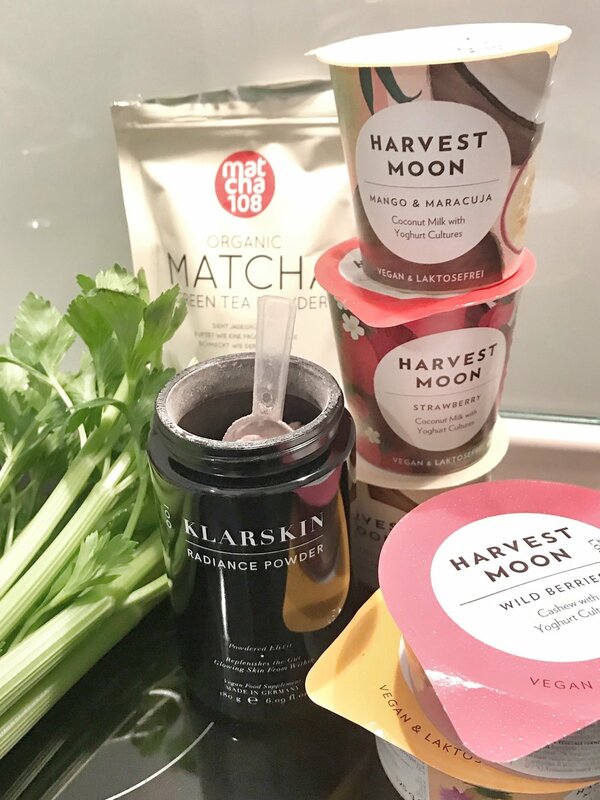 The tea, water and Radiance Powder can also be taken at work and need virtually no prep time – unless you consider stirring a spoon in a glass for 15 seconds prep! I will have my first meal at lunch time. If I am on the go I will start with a non dairy yogurt with nuts – Harvest Moon is my favourite brand (not sponsored). This is more a psychological thing as I like to trick myself into thinking it still counts as breakfast! More often than not I will buy something on the go that is healthy – vegetable or salad based with beans and legumes, sweet potatoes, nuts, whole grains and sometimes fish. I have to admit I felt great after my week long intermittent fasting routine. I did however notice I was colder than usual that week but my skin and mental clarity had clear improvements. In particular the whites of my eyes became brighter, and my skin looked fresher. Although I don’t suffer from acne anymore, I do still have slight pigmentation from acne scarring that becomes redder in colder months. I don’t want to speak too soon, but the week of my fast it was quite cold yet the redness did not become as inflamed or noticable as per usual. I’d like to mention that I often suffer from huge mood swings when I’m hungry, and I do believe the fast helped me become accustomed to not eating every time I had a slight desire to. I also know that the Radiance Powder contains high doses of plant based Fibres which not only regulates blood sugar levels, but leaves you with a fuller feeling for longer. Our microbiome consists of bacteria, fungai and a diverse eco system of trillions of species of bacteria, viruses and fungai. It is the foundation of the nutrient delivery in your body and in some studies is said to actually regulate our genome. It’s esentially the core of what you are as a body. The Radiance Powder was designed to aid your body in the function of its own microbiome. To be clear, this is why we do not advertise the powder to be taken continuously but rather for a month (or two or three) at a time. There is no harm in taking it on an ongoing basis consistently, but it is developed to aid your microbiome in the creation of its own healthy bacteria and flora. No probiotic or complex probiotic on the market can continuously sustain and feed your gut as the complexity of the human body is too varied. We transform, adapt and change depending on the environment around us, the quality and diversity of our food intake, and our feelings and lifestyle. Our formulation is based on a mix of additional enzymes, minerals, vitamins and plant powders that will enhance and feed the nutrients your body requires to work. This is why the Powder is not like any ordinary pre and probiotic. Plant based fibres are used to populate and feed the live bacterial cultures to form your own microbiome. Digestive Enzymes are included to ease the digestive process and allow increased nutrient absorbtion. Vitamins that the majority of individuals are shown to be lacking in are included to feed deficiencies. We do not use capsules to allow faster and easier absorbtion. We included a wide variety of strains as our microbiome is known to be diverse, and include 6.5 billion bacterial cultures as academic studies have show that a much larger injection of bacteria may not actually be effectively absorbed by some systems, yet 6.5 Billion cultures is a high enough dose to have a noticable effect alongside all types of diets and lifestyles. The powder is created to solve dysfunction, and taking it consistently for a month before eating in the mornings just means that you are allowing your body time to absorb and build on the formulation. Our bodies are complex organisms and will adapt to anything you feed them with, and this is why I think the powder is such an important first step in any fasting routine - you are giving your body time and space to find the dysfunction and work to resolve it. If you have any questions in regards to my Intermittent Fasting Routine, please email support@klarskin.com. Thank you for reading!